Trip to Bombay was long and boring. The train was late an hour or so, and reached Aluva by 5 in the evening. I got on the train and got the seat that I hate the most, the bottom seat of the two seat section of three tier sleeper. After all, an Adventure without Challenges is not an adventure at all. My seat mate was one Mr. Joseph, an ex-Army officer, so I had a false sense of security. My compartment was full of old people, I had to listen to a bunch of boring conversations, shaking my head and agreeing to everything they say. My only salvation came when Caroline, and old friend of mine from school gave me a call in between. She was in UK and we hadn’t talked for the past 4 years or so. I had the dinner that my mom packed me with, secured my bags with chain (to which the old people started laughing to) and got into the sleeping mode. The next thing I knew was when Joseph woke up at 5 in the morning to get down at Goa. Then again I got into the sleeping mode and slept all the way till lunch. Had lunch, made some phone calls to make arrangements for my reception in Bombay (:P). Spent a couple of hours more, there was nothing more to see other than barren lands and isolated homes. The train reached Thane right on time, I have no idea where they made up for the delays. The station clock read 16:03 and the time on schedule for arrival was 16:05. I am told that Netravati usually arrives at Platform 7, but this time I was on 6th. My host, Sanal took about 15 minutes to find me, we went to the Bus Depot and took a bus to Meera Road. 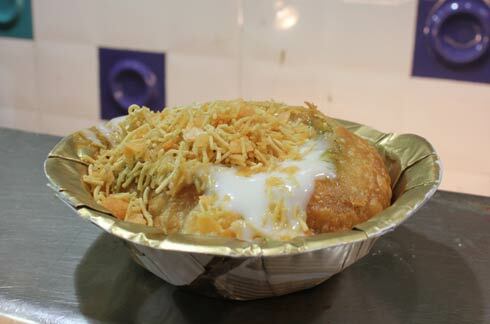 After some casual chit-chat with Alice Auntie and a bath, we went out to see the city had something they call the Dahi Kachori. I kept clicking. Came home, had dinner and slept. The next day the plan was to go to see the Gateway of India. Me and Sanal got out by about 10 in the morning. In Bombay, Train is the preferred mode of travel. Here they get to buy Train passes in advance. When you decide to take a train, you punch the passes with the right amount and get on the train. No standing in queue for the ticket. Also I found that the people are very cooperative, compared to Cochin. I was in an inter city train and we were about to reach a station, the people inside asked us to get to one side so that the people outside could get in easily. That was so thoughtful of them. We got on a train to Church Gate. We had Punjabi Thali from a local restaurant and went in search of an LIC office; Sanal had some work there. 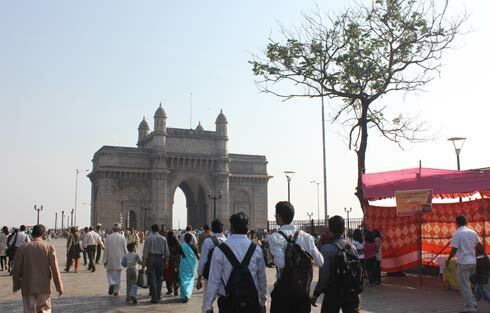 Afterwards we got on a taxi and went to see the Gateway of India. 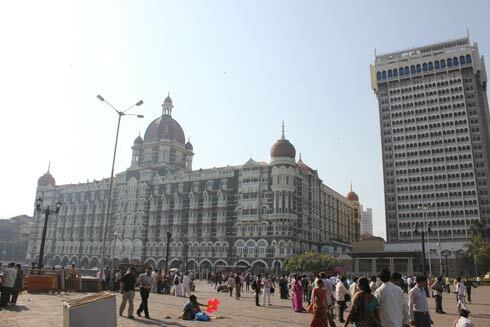 The TAJ Hotel (where the terrorists attacked) is just opposite to the Gateway of India. 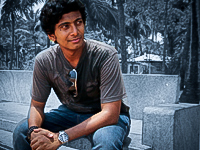 Then we went to Marine Drive, had Ragda Pattice clicked some awesome snaps. We had to catch train before the city rush begin, so we rushed to the station. 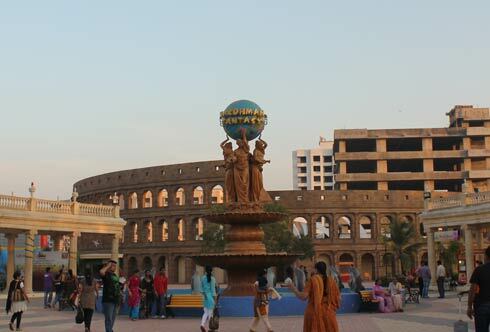 Got a train and got down at Meera Road and went to see Vardhaman Fantasy Park. They have all the seven wonders of the world setup there, looks good. Lots of work is remaining though. So lets call it a day, was awesome! I am not sure about your language or your write up. Good that you write. 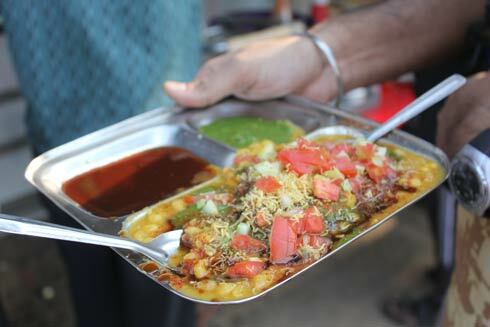 I was more fascinated to see you using Bombay through out the writeup. 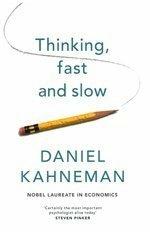 Liked that aspect of the whole read. Could have changed the title to Bombay as well. Whats the big deal with Bombay or Mumbai?